If you could peek inside the devil’s toolbox, you’d see precision instruments for leading people astray, as well as a few well-worn tools that are obviously among his go-to gear. This deception is cunning because it relies on a couple of true ideas to get you to swallow the big lie. It’s true that we should strengthen our relationship with God and that people are imperfect, but these facts don’t mean that the very idea of a church is wrong. 3. The Church helps us become better people. 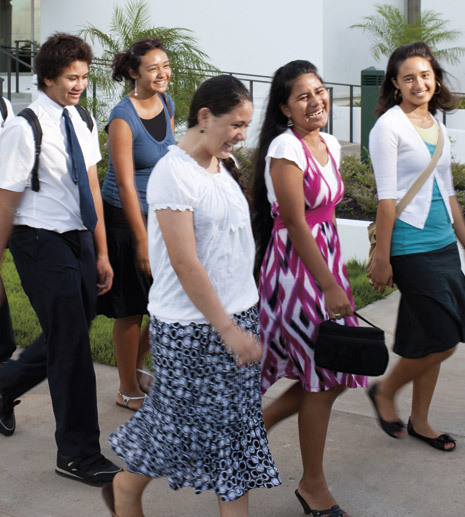 Elder Donald L. Hallstrom of the Presidency of the Seventy recently taught: “We need the gospel and the Church. In fact, the purpose of the Church is to help us live the gospel.”3 Though the Church is made up of imperfect people, it helps us become more like Jesus Christ by teaching us His doctrine, giving us opportunities for service and personal growth, and allowing us to enter into and renew covenants with God. “We yearn, as spirit children of our Heavenly Father, for that joy which we once had with Him in the life before this one. His desire is to grant us that sacred wish for unity out of His love for us. 5. “Organized” is not a synonym for “bad” or “corrupt.” Usually when people call someone or something “organized,” it’s a compliment. But somehow in religion it’s a put-down. According to Elder Neal A. Maxwell (1926–2004) of the Quorum of the Twelve Apostles, one of the reasons Christ organized His Church was “because random, individual goodness is not enough in the fight against evil.”5 The Lord spelled out the issue clearly when He said, “Behold, mine house is a house of order, saith the Lord God, and not a house of confusion” (D&C 132:8). Organized is exactly what a religion needs to be. As you encounter the lies that are the tools of the devil’s trade, remember that you have your own set of tools to help you live the gospel﻿—tools available to us through the Church of Jesus Christ: the scriptures, the gift of the Holy Ghost, your testimony, and truths revealed through modern prophets. Dallin H. Oaks, “Two Lines of Communication,” Liahona and Ensign, Nov. 2010, 85. Dallin H. Oaks, “The Only True and Living Church,” Liahona, Aug. 2011, 50; New Era, Aug. 2011, 4. Donald L. Hallstrom, “Converted to His Gospel through His Church,” Liahona and Ensign, May 2012, 14. Henry B. Eyring, “Our Hearts Knit as One,” Liahona and Ensign, Nov. 2008, 69.